The Mountain Greenie offers a chance to relax in a modern house with a stunning rural setting. 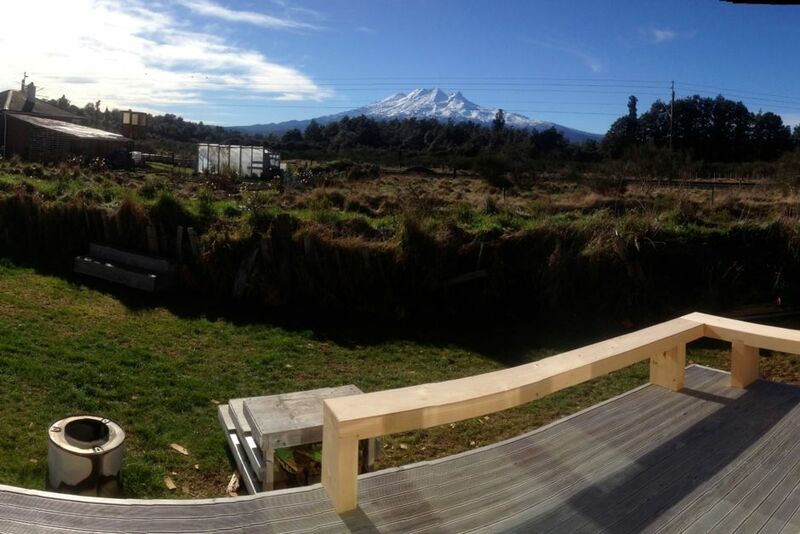 It backs onto a bush reserve and looks over the forest at Mt Ruapehu. Originally a railway township Rangataua is a charming town where we walk and ride our bikes on the streets. The trains don't stop these days but you can wave from the deck! Five minutes to Ohakune or the Junction, nothing is far away if needed. In just over 20 minutes you can be in the Turoa carpark! Close to ski fields, the Old Coach Road mountain bike trail, bush walks in a World Heritage Area and the epic Tongariro Crossing day walk. Also canoeing, kayaking and rail car trips within an hour. Enjoy Cafe's, shops or the library in Ohakune or just chillax at home. There's something for everyone. Built as a prototype house with a double wall cavity, it's level of insulation is twice the industry standard. It is fitted with thermal blinds, natural flooring (cork, bamboo, linoleum and wool carpets), recycled wooden benches and dining table. The kitchen and bathroom cabinetry is made locally and with beautiful birch plywood. The macrocarpa seating on the large sunny deck was milled just down the road and the outdoor baths will amaze! In the house you can plug your music into the speakers (standard 3.5mm jack), watch a movie (bring a dvd or USB stick), play board games or flick through magazines. There's also a house information booklet if you'd like to know more about the house you're staying in, how it functions and why it looks like it does. In the garage there's foosball, table tennis, a spectator couch and a drying room (to help keep the humidity down in the house!) and room to store all your bikes and skis. The Mountain Greenie is designed to be both a learning opportunity and a wonderful getaway. If you're up for either of those things then it may be just what you're looking for. * the house is not suited to toddlers with floor heaters. * no WIFI/TV/SKY as you're here for a holiday! * please notify of any breakages/damages/problems asap. I was born in Wellington, New Zealand and have spent in time in most of the major cities here. After university I worked by the Southern Alps in the South Island before going overseas to work in the U.K. and in The Rocky Mountains in Canada. I came back to New Zealand to be closer to family and have enjoyed spending more time in the Central Plateau and around Rangataua. The Mountain Greenie was build as a collaboration prototype house and moved onto the site at Rangataua. It is one of the most (if not THE most) insulated houses you will find. It suits being in the coldest part of the North Island due to it's exceptional insulation. The view doesn't hurt either. Modern furnishings allow maximum relaxation WITHOUT tv and wifi to distract you from your holiday. The views from the house, the yard and the outside baths is all for your enjoyment. Watch the groomers work at night in the winter and the last rays of sun hit the slopes on summer evenings. The foosball, table tennis and board games keep you sane when the skiing, mountain biking and hiking is all done. You even get to wave to the tourists on the trains that roll past. Convection heaters in each room on timers (since the house is so well insulated). Once the house has reached optimum temperature please use the heaters responsibly. The garage contains: - the drying room (heater and dehumidifier on a 6 hour timer) - table tennis (ping pong) - foosball. Some basic items only. Please replace what you use. Full appliances; toaster, sandwich press, blender. Breakfast bar with 4 stools. Dining table with 2 bench seats. 2 extra seats in garage if needed. Speakers with 3.5mm jack to plug into your phone or computer to play music. A DVD player is attached to the back of the TV screen. Also takes USB stick and HDMI input if needed. A variety of outdoor magazines to peruse at your leisure. Ping pong (table tennis) and foosball are in the garage (along with the drying room). Scrabble, cards, cranium and chess are some of the games to keep you entertained inside. Plenty of lawn to play games on. Deck and seats facing the mountain views. Great house, well set up and great views! An interesting house that has had a lot of thought and effort put into it. Really comfortable with everything we - a family of 4 - needed for a comfortable stay. We loved the outdoor baths all the games and we learnt about building and maintaining modern houses. Loved being here. Cozy, Quiet and just the place we needed. Best kitchen ever. And water pressure ! Wow. This place is amazing. I can highly recommend, particularly to those who are wanting to de-stress. It's a delightfully simple and elegant place. Eco-as!! AMAZING place!!! So warm! Fabulous views. Loved it !